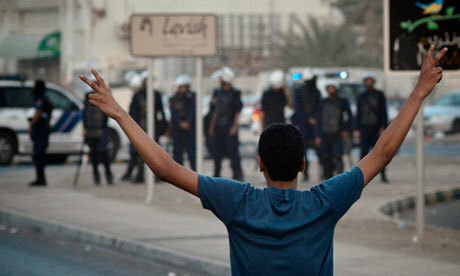 Why didn’t CNN’s international arm air its own documentary on Bahrain’s Arab Spring repression? A former CNN correspondent defies threats from her former employer to speak out about self-censorship at the network. The CNN crew itself was violently detained by regime agents in front of Rajab’s house. As they described it after returning to the US, “20 heavily-armed men”, whose faces were “covered with black ski masks”, “jumped from military vehicles”, and then “pointed machine guns at” the journalists, forcing them to the ground. The regime’s security forces seized their cameras and deleted their photos and video footage, and then detained and interrogated them for the next six hours. Lyon’s experience both shocked and emboldened her. The morning after her detention, newspapers in Bahrain prominently featured articles about the incident containing what she said were “outright fabrications” from the government. “It made clear just how willing the regime is to lie,” she told me in a phone interview last week. CNN’s total cost for the documentary, ultimately titled “iRevolution: Online Warriors of the Arab Spring”, was in excess of $100,000, an unusually high amount for a one-hour program of this type. The portion Lyon and her team produced on Bahrain ended up as a 13-minute segment in the documentary. That segment, which as of now is available on YouTube, is a hard-hitting and unflinching piece of reporting that depicts the regime in a very negative light. On 19 June 2011 at 8pm, CNN’s domestic outlet in the US aired “iRevolution” for the first and only time. The program received prestigious journalism awards, including a 2012 Gold Medal from New York Festival’s Best TV and Films. Lyon, along with her segment producer Taryn Fixel, were named as finalists for the 2011 Livingston Awards for Young Journalists. 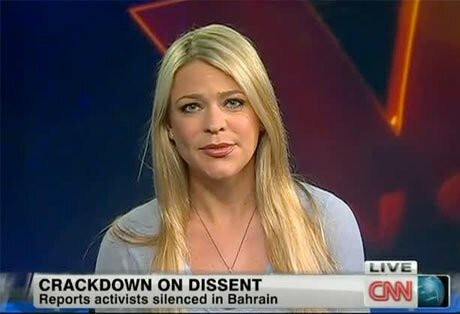 A Facebook page created by Bahraini activists, entitled “Thank you Amber Lyon, CNN reporter | From people of Bahrain”, received more than 8,000 “likes”. It is CNN International that is, by far, the most-watched English-speaking news outlet in the Middle East. By refusing to broadcast “iRevolution”, the network’s executives ensured it was never seen on television by Bahrainis or anyone else in the region. 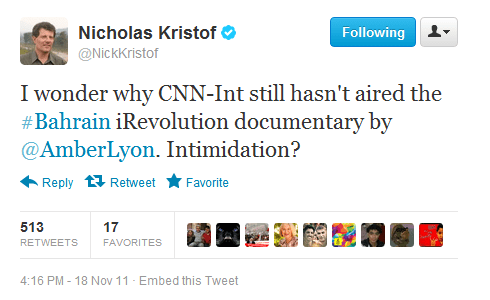 CNNi’s decision not to broadcast “iRevolution” was extremely unusual. Both CNN and CNNi have had severe budget constraints imposed on them over the last several years. One long-time CNN employee (to whom I have granted anonymity to avoid repercussions for negative statements about CNN’s management) described “iRevolution” as an “expensive, highly produced international story about the Arab Spring”. Because the documentary was already paid for by CNN, it would have been “free programming” for CNNi to broadcast, making it “highly unusual not to air it”. The documentary “was made with an international audience as our target”, said Lyon. None of it was produced on US soil. And its subject matter was squarely within the crux of CNN International’s brand. Despite Lyon’s being stonewalled by CNNi, she said facts began emerging that shined considerable light on the relationship between the regime in Bahrain and CNNi when it came to “iRevolution”. Upon returning from Bahrain in April, Lyon appeared on CNN several times to recount her own detention by security forces and to report on ongoing brutality by the regime against its own citizens, even including doctors and nurses providing medical aid to protesters. She said she did not want to wait for the documentary’s release to alert the world to what was taking place. Internal CNN emails reflect continuous pressure on Lyon and others to include claims from the Bahraini regime about the violence in their country – even when, says Lyon, she knew first-hand that the claims were false. One April 2011 email to Lyon from a CNN producer demands that she include in her documentary a line stating that “Bahrain’s foreign minister says security forces are not firing on unarmed civilians,” and another line describing regime claims accusing “activists like Nabeel Rajab of doctoring photos … fabricating injuries”. As negative news stories of its brutal repression grew in the wake of the Arab Spring, the regime undertook a massive, very well-funded PR campaign to improve its image. As reported by Bahrain Watch, the regime has spent more than $32m in PR fees alone since the commencement of the Arab Spring in February, 2011, including payments to some of Washington, DC’s most well-connected firms and long-time political operatives, such as former Howard Dean campaign manager Joe Trippi. One of the largest contracts the regime had was with the DC-based PR firm Qorvis Communications. As Time reported last November, the firm, which also does extensive PR work for Bahrain’s close allies, the Saudi regime, “has a branch dedicated to rehabilitating the reputation of unsavory governments, a niche practice that has seen great demand in the wake of the Arab spring”. Qorvis often led the way in complaining to CNNi about its Bahrain coverage. An internal email from CNN at the beginning of 2012, seen by the Guardian, records the firm’s calling to complain about excessively favorable mentions of Nabeel Rajab, who had been arrested and charged over an anti-regime tweet, and was just this month sentenced to three years in prison for an “illegal demonstration”. In response to several inquiries, Bahrain’s Information Affairs Authority refused to say whether they had complained to CNNi about Lyon and “iRevolution”. A spokesman, Fahad A AlBinali, instead offered only a generic statement that “on occasion we contact media outlets to provide correct information or a balanced view of the subject,” and, he claimed, when doing so, they are simply trying “to help ensure that coverage of Bahrain is accurate and unbiased”. Subsequent attempts to obtain specific answers from the authority about the regime’s complaints to CNNi about “iRevolution” and Lyon went unanswered. In March 2012, Lyon was laid off from CNN as part of an unrelated move by the network to outsource its investigative documentaries. Now at work on a book, Lyon began in August to make reference to “iRevolution” on her Twitter account, followed by more than 20,000 people. It is true that CNNi can point to numerous recent reports describing the violence against protesters by the regime in Bahrain. Given the scope of the violence, and how widely it has now been reported elsewhere, it would be virtually impossible for CNNi never to broadcast such reports while still maintaining any claim to credibility. But such reports required far more journalistic courage to air in the first half of 2011, when so few knew of the brutality to which the regime had resorted, than now, when it is widely known. Moreover, CNNi’s reports on the violence in Bahrain take a much more muted tone than when it reports on regimes disfavored by the US, such as Iran or Syria. More importantly, the tidal wave of CNNi’s partnerships and associations with the regime in Bahrain, and the hagiography it has broadcast about it (see the accompanying commentary on the relationship between the network and the regime), appear to have overwhelmed any truly critical coverage. Posted on September 7, 2012, in Middle East and tagged Bahrain, Bahraini Revolution. Bookmark the permalink. Leave a comment.